Construction on the new, nine-unit luxury condominium project is expected to be completed in late 2019. John Marshall Bank provided a construction loan for The Pacifica. At The Pacifica’s groundbreaking ceremony on Tuesday were from left, Molly Heffner, project architect, GTM Architects; Colline H. Ayala, partner, GTM Architects; Peggy Crowley, COO, J Street Companies; Robert C. White, Jr., councilmember at large, Council of the District of Columbia, Bruce Baschuk, chairman, J Street Companies; Natasha Shulinina, VP – Commercial Lending, John Marshall Bank; Tom McCullough, founder and president, McCullough Construction. 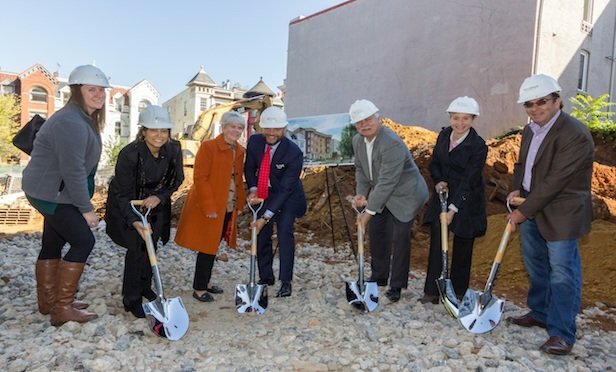 WASHINGTON, DC—The J Street Companies has broken ground on The Pacifica condominium development on a site two blocks from Dupont Circle here.